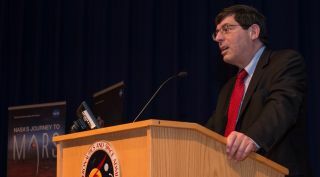 Chris Scolese has been director of NASA's Goddard Space Flight Center since March 2012. WASHINGTON — The White House has nominated a longtime NASA center director and former acting administrator to be the next director of the National Reconnaissance Office (NRO). In a statement Feb. 7, the White House announced it was nominating Chris Scolese, the director of NASA's Goddard Space Flight Center, to be the next NRO director. If confirmed by the Senate, he would succeed current director Betty Sapp. Scolese became director of Goddard in March 2012 after Rob Strain left the agency to join Ball Aerospace. Scolese had previously worked at NASA Headquarters as the agency's associate administrator and chief engineer. As associate administrator, the highest-ranking civil service position at NASA, Scolese became acting administrator in January 2009 when Mike Griffin left the agency at the end of the administration of President George W. Bush. Scolese served as acting administrator for six months, until the Senate confirmed the nomination of Charlie Bolden as administrator. Scolese worked in various positions at Goddard and NASA Headquarters earlier in his career, primarily involving Earth science missions. Prior to joining NASA in 1987 he served as an officer in the U.S. Navy working on classified programs and worked as a civilian at the Defense Department and the General Research Corporation. The selection of Scolese, who has worked in civil but not national security space positions for most of his career, represents a significant change in direction for the NRO, which is responsible for satellite reconnaissance systems for the intelligence community. Sapp, for example, was an Air Force officer who later worked for the Central Intelligence Agency and was principal deputy director of the NRO prior to becoming director of the office in 2012. Scolese, though, would not be the first NASA official to lead the NRO. Hans Mark, director of the NRO in the late 1970s, was previously the director of NASA's Ames Research Center. Mark, who later became Secretary of the Air Force, returned to NASA in the early 1980s to be deputy administrator.